The action of cleaning out morally goes forward. On after the other the crazy dogs, the Jewish agents, collaborators with the Gestapo are getting shot. A very painful fact for the ghetto is that among the traitors there is also a seventy-five year old well known thinker and publicist, Dr. Alfred Nosig who wandered into Warsaw with the refugees from Czechoslovakia. One has to believe that brain degeneration of age has destroyed his moral sense. From his desk the Fighting Organization messengers pulled out the organizations fighting plans, addresses, and bunker placements he was prerparing to give to the enemy. The enemy has concealed himself. He is now making no energetic moves. Like a blood thirsty tiger he paces quietly, prepares the death spring for the last attack and the Jews too are preparing themselves. The organization works. It is clear that Dr. Ringelblum and his co-workers of the Archive have a close relationship to JOB (Jidovska Organizatzia Boyova) both personal and organizationally. The materials in the Archives ar put under the care of the fighting organization. 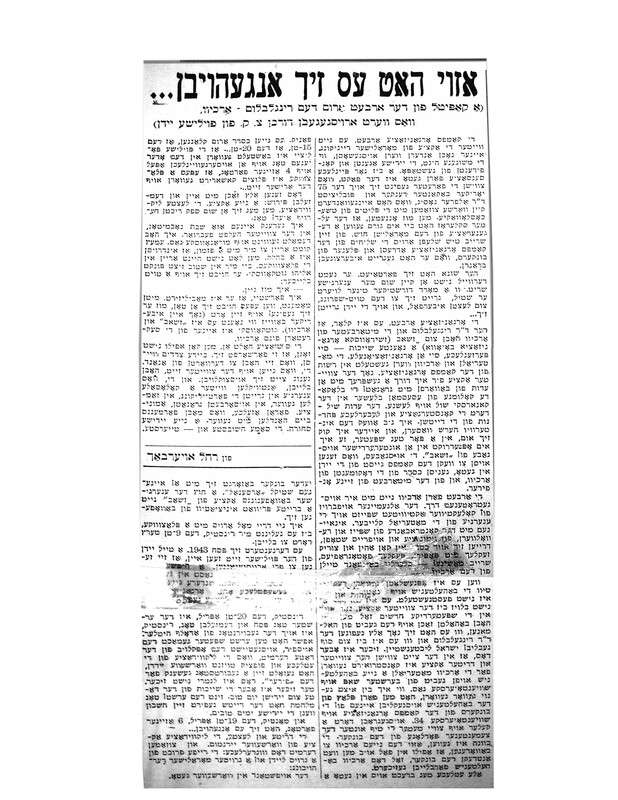 After the second action I (Rachel Auerbach) had a conversation with a witness to the volleys of grenades on the columns of SS man Blesher in the Kanarski synagogue on Leshna. The witness describes the shock and laughable bewilderment and fear the Germans displayed. I gave the interview to Hirsch Wasser and before I can turn around, a couple of days later, it is printed in the underground edition of J.O.B. These editions purport to awaken the spirit to fight of ghetto Jews, benefit continually from the documents in the Archives and from the partnership with their leaders. The work for the Archive goes a familiar way. The general stimulus of collective activity also nourishes the energy of those who collect means. Together with contraband and food, revolvers, ammunition and bombing stuff, there are constantly small sacks in motion with “paper”, packages of photographs, typewriters and all kinds of bits and pieces of the archive. When the hiding place on (street is unreadable) was locked up is not certain. It is not (unreadable) until the second action but also in later months on Halman where Dr. Ringelblum was still hidden. Yisroel Lichtenshtein was also hidden… But one thing is certain; that between the second and the third Actions, a new hiding place was constructed for Archive materials in the Brush Workshop, a workshop that made brushes, on Shventoierske Street. As I have just learned, one of the places chosen was in the bunkers of the fighting organization on Shventoierske 34. There a cellar was dug out, two meters deep under the cement floor of the bunker. The purpose was to keep the new Archive so safe that even if the bunker is discovered the Archive hiding place would be secure. These are all things with one and the same explanation: A new Action: The Final Liquidation. One can be sure to expect that in a few days. I understood that he is being called up. The minute anything begins to happen he must go to his designated post (more proof of how closely associated JOB and the Archive are.) Gutkovski is one of the Secretaries of the Archive. The situation continues. One cannot even say that is worsens. Both sides know what they can expect of the other. Those who are leaving for the Aryan side have enough time to make the move. Those who will stay are developing further a colossal energy to ready the defense, to collect weapons, to work out grenades, ammunition. There are those who are making fortunes selling weapons. A new Jewish material. The most important and the most expensive. Every bunker is preparing to defend itself with its own mini “arsenal”. Besides the defensive weaponizing action of JOB there is also a broad private initiative to defend oneself. I go out three times to a designated outpost until I succeed on Tuesday, March 9th to remain there. Pesakh1943 is coming closer. Some of the Jews on the Polish side realize they left too early. Tuesday, April 20th is the first day of Passover and is also the birth day of Adolf Hitler. Maybe it was later that day that they realized the significance of that date for liquidating more than fifty thousand Warsaw Jews as a birthday gift for the Fuhrer. This is uncertain. But what is certain is the closeness of the date to the Jewish Holiday. Since the first day of war, the Germans recognized the significance of events related to Jewish Holidays. The uprising in the Warsaw Ghetto.